Initially it would look like director Jonathan Levine and the comedy writer Evan Goldberg wouldn’t be compatible with each other. Levine is a director who has worked on slasher films (‘All Boys Love Mandy Lane‘) and coming-of-age dramas (‘The Wackness‘) whilst Goldberg writes successful stoner-comedies (‘Pineapple Express‘, ‘This Is The End‘ and almost ‘The Interview‘). However, both came together for the 2011 dramady film ‘50/50‘ which starred Joseph Gordon-Levitt as a cancer patient in his 20s. The film was a huge critical hit and one of the biggest surprises of that film was Seth Rogan’s dramatic chops as he played the best-friend role. After trying their hand at the drama that Levine can do so well, it seems that the group want to make lightning strike twice with comedy with Gordon-Levitt and Rogan on-screen again with Goldberg’s writing team. Genuinely good Christmas comedies are increasingly hard to come around but can these contrasting sensibilities match for ‘The Night Before‘? Could this be a Christmas miracle? Magic is in the air during this time of year after all. Christmas Eve, 2001. Ethan (Gordon-Miller) attends the funeral of both his parents after they die in a car crash and to cheer him up his best friends Isaac (Rogan) and Chris (Mackie) decide to take him on a wild, drunken night out every year on Christmas Eve. Fast-forward to Christmas Eve 2015 and the trio decide to end their yearly tradition as Isaac is about to become a father and Chris has become a famous football player. With a box full of drugs and a need to get drunk, the trio set out to find the famed “Nutcracker Ball” party while Ethan also tries to make amends with his ex, Diana (Caplan). There’s always something incredibly romantic and awesome about Christmas time in New York. We’ve seen 1950s New York brought to life during the festive season in ‘Carol‘ earlier this year and ‘The Night Before‘ does it in the present day. It’s a great setting to have these three friends go on a walking-tour of the city as they try to hit their regular pit-stops; karaoke, Chinese food, heavy drinking etc. And make no mistake, these three are great friends and the chemistry between them feels genuine thanks to great performances and a strong script (as well as funny ad-libbing). We’ll get to all of the laughs, profanity and stoner-humour in a minute but what really makes ‘The Night Before‘ stand out is that it has a real sincere core to it. Isaac and Chris came to Ethan in his time of need during a time of year where the rest of the world seems to chastise you for NOT being cheerful and helped to lift his spirits and to make their own annual tradition. There are cynics around this time of year, but that is completely fine because the holidays can be a tough time for some people. As a result, the fact that this movie’s closest connection to Christmas is the fact that it takes place mostly on Christmas Eve (as opposed to being religious, or based around Santa etc.) makes sense and benefits the story. The instigating factor this this particular night is due to Isaac becoming a father and Chris becoming a world-famous footballer. Isaac has parental responsibilities but because his wife is absolutely awesome she gives him a box of drugs so he can enjoy his final night of freedom however he wants. But because his wife knows nothing about drug doses, the quantities are messed up meaning that Isaac goes completely off the wall and this is why you need an actor like Seth Rogan who can tow the line between being an “everyman” as well as being a brilliant physical comedian. While Joseph Gordon-Levitt is playing the main character, Rogan is the key comedic selling point and gets many of the film’s biggest laughs. One of the film’s funniest sequences has Rogan, dressed in a knitted Jewish jumper, attending a midnight Christian Christmas Mass while high as a satellite. The ensuing set-piece made me laugh harder than anything else in 2015. Instead of getting regulars such as James Franco or Jonah Hill to play one of the friends, ‘The Night Before‘ gives us Anthony Mackie who fits right into this troupe effortlessly. The chemistry is instant and his character’s arc about finding time for your family at Christmas adds extra dimensions. Though a sub-plot about him using steroids to become a famous athlete doesn’t really go anywhere or have any sort of punch-line. Speaking of sub-plots, Ilana Glazer has a small recurring role as a real-life Grinch and despite a strong set-up she just disappears from the movie entirely. But with this being a Sony movie it feels like Chris’ role in this film is to primarily spout product placement. The trio are transported around New York in a Red Bull Limo filled with the energy drinks and Chris is always on his Sony phone (making sure he uses lots of apps and functions, including “the best camera” to get great shots in all lighting conditions, of course). I know the product placement KINDA works because Chris is a celebrity who is actually trying to shill these products in context, but the fact that the Sony logo was in front of this movie still makes its inclusion feel a bit icky. Joseph Gordon-Levitt more-or-less plays the straight role in the movie. Yeah, he gets some funny moments but he’s the one with the arc as his character Ethan has to move on with his life and find a new coping mechanism when his friends will be finding their own lives. His love story sub-plot feels like a token excuse to get a female presence in the movie as the underrated Lizzy Caplan doesn’t get much of substance to do, although the love-story does pave the way for one of the most unexpected and humorous celebrity cameos I’ve seen in some time. Despite a few narrative and story shortcomings, ‘The Night Before‘ works where it counts and that’s in delivering plenty of laughs and a lot of wit with a sprinkling of Christmas sincerity. And while Michael Shannon’s role may be small, he almost steals the movie with his un-nerving intensity as a drug dealer who works overtime on Christmas. Michael Shannon just needs to be in more movies and this isn’t even his first team-up with Joseph Gordon-Levitt as the two starred in ‘Premium Rush‘ in 2012 in which Shannon was the villain and was the best part of that film. 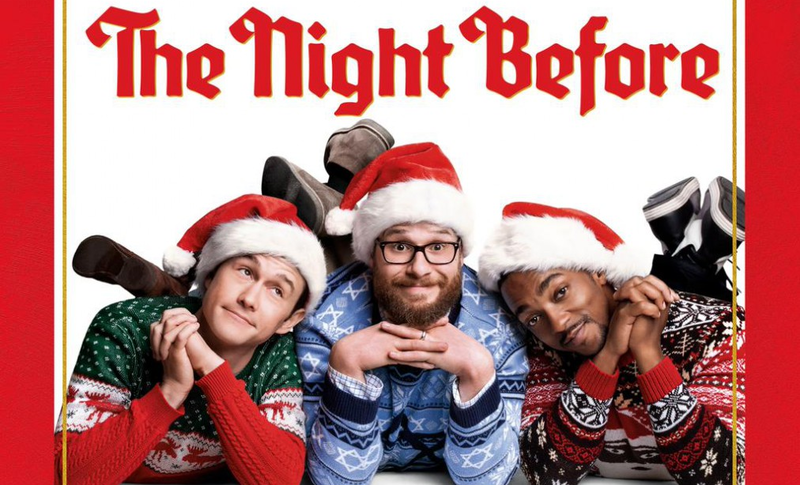 ‘The Night Before‘ goes above and beyond in terms of its production values for a comedy of this style. But then again, looking at the production values for ‘The Interview‘ and ‘This Is The End‘, it shouldn’t be much of a surprise at this point. There are lots of locations, the lighting is great, New York’s streets full of Christmas lights is inherently cinematic and there are even some goofy CGI shots thrown in for fun that work in context. The only production issue is the editing which is always going to be an issue when so much ad-libbing and improvising is involved and more casual movie-goers probably won’t notice it. But those who are a stickler for continuity may be miffed. Good Christmas comedies are a rare occurrence but ‘The Night Before‘ delivers on the belly laughs and then some. It feels more mainstream and accessible than Goldberg’s stoner-comedy movies of the past but due to the Christmas setting it feels appropriate and doesn’t feel dumbed down or constrained. The cast are uniformly great with Anthony Mackie fitting into the group perfectly and Seth Rogan proving why he’s one of the best on-screen comedians of the 21st Century. There’s a real undercurrent of holiday cheer and goodwill towards men in what could have just been a poop/farts comedy. One of the funniest movies of the year and this is will definitely be a yearly viewing tradition for me. See it in theatres now and bring some good friends with you. I give ‘The Night Before‘ 4 stars out of 5.